Fanuc Spindle Amp Alarm codes for amplifiers that start with part number A06B-6088, A06B-6102, and A06B-6078. MRO Electric and Supply maintains a comprehensive stock of new and used FANUC CNC parts including FANUC Spindle Amps. If you need a replacement part, please call 800-691-8511 or email sales@mroelectric.com. This guide is meant to help clear SM-EZ Motion HF Trips on a Unidrive SP drive from Emerson Control Techniques. The SM-EZ motion module is used with SP drives and is programmed using Power Tools Pro. It allows users to create specific motion profiles such as indexing, home routines, electronic gearing, and many others. An HF (hardware fault) can be generated by the drive if there is a problem with the solutions module. The drive will display the trip as SLX.HF. It is sometimes possible to correct this trip without replacing the module. The EZ Motion program in the module may become corrupt which can cause this type of trip. Clearing the program and setting the module back to factory settings may resolve the trip. Before clearing the module a drive reset and power cycle should be performed. They could correct the trip as well. 6. Reload your EZ Motion program back into the drive. The HF trip could be resolved at this point. 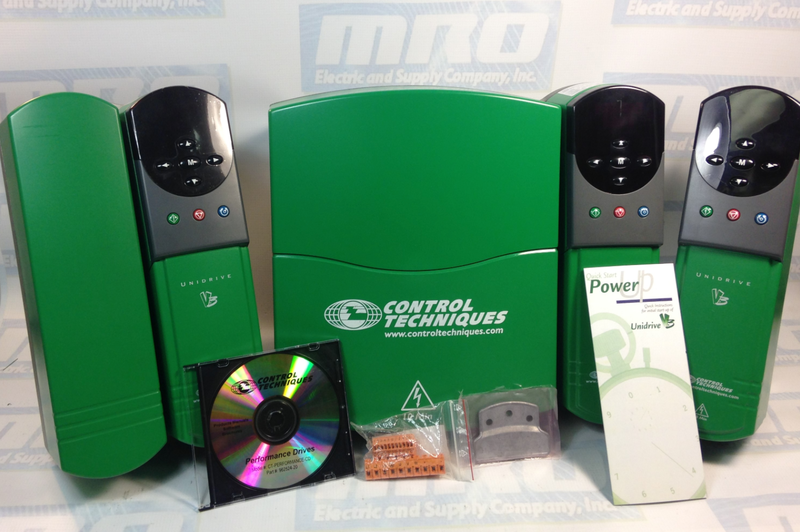 MRO Electric supplies and repairs a large number of Control Techniques Unidrive SP parts. To request a quote, please call 800-691-8511 or email sales@mroelectric.com. Normally, this Simodrive F15 Alarm is in reference to the fans in the unit failing, which in turn causes an over temperature issue in the unit. This is normally caused by the fans not being cleaned out regularly which causes them to jam, which can then short out other internal boards in the unit. This was the case for the unit the customer sent in, so we took apart the unit, replaced the fans, and replaced several internal boards that had shorted. We would highly recommend routine cleaning of Simodrive fans, especially dirty ones, to prevent drive failure. MRO Electric and Supply supplies and repairs a large number of Siemens Simodrives. To request a quote, please call 800-691-8511 or email sales@mroelectric.com. These codes and troubleshooting apply to DC and AC Fanuc power supplies that begin with part number A06B-6077, A06B-6081, and A06B-6087. On the LED display for these units, a “-” will mean that the power supply is not ready while a “0” means that the power supply is powered up correctly. If it reads something other than these two then the power supply has an alarm that needs to be corrected. Below is the list of Fanuc Alpha Power Supply fault codes. MRO Electric and Supply maintains a comprehensive stock of new and used FANUC Spindle Amps. If you need a replacement part, please call 800-691-8511 or email sales@mroelectric.com. AL-01: Overcurrent in the Main Power Module. AL-03: The temperature of the main circuit heat sink has risen abnormally. AL-04: The DC Voltage has dropped. AL-05: The main Capacitor was not recharged within the specified time. AL-06: The Input Power Supply is Abnormal. A common alarm on installation of a new alpha power supply is an AL-05. If you have this alarm we recommend double-checking the bus bar connector at the top of the power supply to make sure it is fully connected. Be sufe to check out our article on FANUC Alpha Servo Troubleshooting as well as FANUC CNC parts. Video of part of the testing process for a UNI1402 Unidrive classic. Be sure to check out our article covering details to maintain Unidrive Classic and Unidrive SP drives here. MRO Electric and Supply maintains a comprehensive stock of new and used Control Techniques Unidrive and Control Techniques Unidrive Classic SP parts. If you need a replacement part, please call 800-691-8511 or email sales@mroelectric.com. Recently we had a customer running a FANUC A06B-6044-H030 spindle unit which was throwing an alarm code. With these FANUC Spindle Amps, the alarming diagnosis is slightly convoluted, so we wanted to do a post explaining how to read the Fanuc AC spindle amp alarms on the top of these units along with the corresponding faults that the alarms relate to. On these AC spindle units that start with A06B-6044 the fault is shown through the four red LED lights on the top of the spindle card that has a part number similar to A20B-1000-0690. Above the LED lights there are the numbers 8, 4, 2, and 1. If you have a fault in your spindle amp, one or more of the lights will go on, and you just need to add the corresponding numbers to get your alarm code. If only the light under the 4 is on that means an alarm 4, and if the 8 and 1 lights are on it is an alarm 9. This alarm will help to diagnose where the problem in your system is. Here is a list of the alarm codes and what the possible causes/solutions for the alarms would be. Check power transistors and replace the fuse. Replace parts, replace the fuse. Check power supply, replace Fanuc Board, replace the fuse. 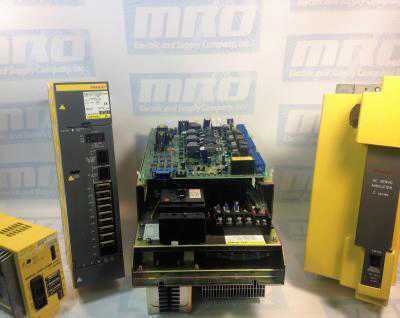 MRO Electric supplies and repairs FANUC Spindle Amps. For more information or to request a price quote, please call 800-691-8511 or email sales@mroelectric.com. AC power supply too high, incorrect setting of the toggle switch for voltage setting. Change the setting from 200V to 230V. The cooling fan is defective, overload, dust and dirty. Correct case and reset the alarm. Output terminals or internal motor of the motor is shorted, defective PCB or transistor module. Before we ship out all of our Unidrives, we fully test them to make sure everything is functioning properly. Here is an example of one of the UNI3404 Drive units that we have in stock being powered up and tested. We have all sizes of the Unidrive Classic series in stock and ready to ship if need be. Check out our repair service as well as our core exchange program. Check out our article covering details to maintain Unidrive Classic and Unidrive SP drives here. This troubleshooting guide is in reference to Fanuc drives that begin with part number A06B-6079, A06B-6080, and A06B-6096 and is meant to help troubleshoot Fanuc alpha drive faults. If a drive status alarm appears on the 7 segment display, where the “-” refers to drive not ready (Waiting for an Emergency Stop signal to power up) and “0” refers to drive powering up correctly. Any other number or letter on this status display is an alarm code. One of the more common faults is an Alarm 8.i Here are some tips to check to see what the issue may be when an alarm comes up on your drive. 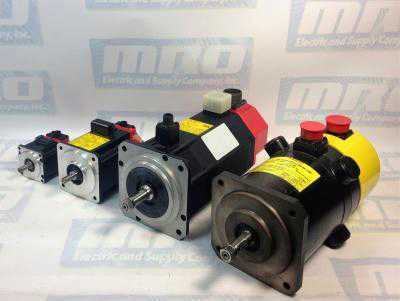 MRO Electric and Supply supplies and repairs a large number of FANUC Servo Drives. To request a quote, please call 800-691-8511 or email sales@mroelectric.com. 1 – Check the link: (A06B-6079 drives only). An A06B-6079 drive can give a fault if the S1 Link is in the wrong position, so check the S1 – JV Connections (Type A Interface) and S2 – JS Connections (Type B Interface). An incorrect setting will cause an Alarm “8”. 2 – Check the wiring: A L motor is wired in the lower terminals and an M motor is wired in the upper terminals, both as U/V/W/E. JV1B connected from the L command plug of the axis card, JV2B from the M command plug. JX1A connected from previous drive, JX1B connected to the next drive in the line. The last drive in the line has a terminator in JX1B. 24v/0v/ESP connected into CX1A from the previous drive, out of CX1B to the next drive in the line. 3 – Disconnect motor cable: Meggar the motor to check the readings. 4 – Power machine on Do this while it is in an emergency stop. The drive is faulty if an alarm occurs, expect a “-” reading. 5 – Release Emergency Stop: Power the machine up after releasing the stop. If an alarm occurs, power the machine off and remove motor wires U/V/W/E (Note – this is dangerous on a vertical axis, brake release, slide drops etc). Release Emergency Stop and power the machine up. The drive is faulty if the alarm occurs, expect “0” reading. 6 – An additional test can be performed for equally sized 6079/6080 amplifiers H201 SVM2-12/12 H301 SVM2-12/12/12 H203 SVM2-20/20 H302 SVM3-12/12/20 (L&M) H206 SVM2-40/40 H303 SVM3-12/20/20 (M&N) H208 SVM2-80/80 H304 SVM3-20/20/20 (L/M&N) The suspect axis can be run from the other amplifier in the drive ie X drives M amplifier, Y drives L amplifier. To do this swap round a – X & Y Motor cables U/V/W/E (at the drive) and b – X & Y Command cables (at the drive) (6096 requires parameters changing to swap X & Y round). The drive is faulty if the alarm remains the same as before the test. For example Alarm “8” is reported on a 6079-H201 drive using JV connections Steps 1~5 above, have been performed and still alarm “8”. Remove the servo motor wires from the lower terminals and reconnect into the upper terminals, upper into lower. Remove JV1B and insert into JV2B, JV2B into JV1B. Retest the machine. The drive is faulty if the same alarm occurs, ie alarm “8” The fault lies elsewhere on the machine if another alarm occurs, ie alarm “9”. In this example the drive has detected an overcurrent from the L axis, alarm “8” Swapping the cables over allowed a different amplifier to control the axis. An “8” alarm would remain if the same drive circuitry detected the overcurrent. A “9” would occur if the overcurrent was detected using the other drive circuitry in the amplifier and the fault would be caused externally from the drive. Fuse F7in DC link is blown out. Fuses F1,F2,F3 for AC input blown out. Fuses AF2 or AF3 on PCB are blown out. Excessive alarm of velocity command circuit offset. Excessive alarm of velocity detection circuit offset. Excessive alarm of ER circuit offset. Spindle selection control circuit is abnormal. View Fanuc Spindle Amp Alarm Codes for Alpha Series here. Low voltage of input power. Open phase of input power.